• In a large bowl, combine flour, sugar, baking powder, baking soda, and salt. • In a separate bowl, beat together buttermilk, milk, eggs and melted butter. Keep the two mixtures separate until you are ready to cook. • Heat a lightly oiled griddle or frying pan over medium high heat. You can flick water across the surface and if it beads up and sizzles, it’s ready. • Pour the wet mixture into the dry mixture, using a wooden spoon or fork to blend. Stir until it’s just blended together. Do not over stir! • Pour or scoop the batter onto the griddle, using approximately 1/2 cup for each pancake. • Brown on both sides and serve hot. 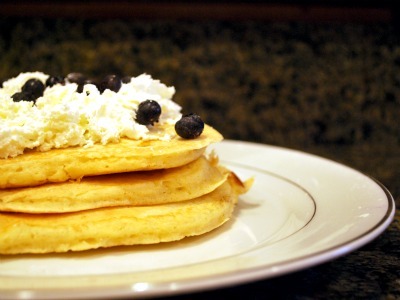 • Garnish with whipped cream and fresh blueberries.